A year ago, Lupita Nyong’o was a relative unknown, but the Kenyan-Mexican beauty is now a household name thanks to her Oscar-winning turn in 12 Years a Slave. She’s also quickly risen to iconic status in the fashion world, thanks to the endlessly chic sense of style she displayed in gown after gown this awards season. But even when she’s not strolling a red carpet, People‘s recently-crowned Most Beautiful Woman still looks pretty and put-together. Here are three of her best casual looks, and how you can score them for less. Pretty in pink: If there’s one thing any woman can learn from Lupita’s style, it’s this: don’t be afraid of bright colors. Time after time, she’s not afraid to wear (and rock) electric shades like this fun hot pink sheath. You, too, can brighten up a night out with a pink dress from Calvin Klein or Trina Turk. With all that color doing the talking, it’s best to keep the rest of your look minimal, with sheer black Anthropologie tights and classic black Antonio Melani stilettos. Add a touch of glitz with some smaller rhinestone drop earrings. A pop of blue: With its dual powers of slimming everything and going with everything, black tends to show up again and again in our closets, to the detriment of other colors. If, like us, you’re tempted to throw on another mostly-black ensemble and call it a day, steal a page from Lupita’s book and make just one element of the outfit pop, while keeping the rest of the pieces black. She chose these electric-blue pants (here are some similar ones from American Eagle and Rock & Republic), but you could just as easily opt for a bright pink or blue shell and black jeans. Complete the look with a black cotton biker jacket and a crisp, tucked-in black button-up, plus those staple black stilettos. 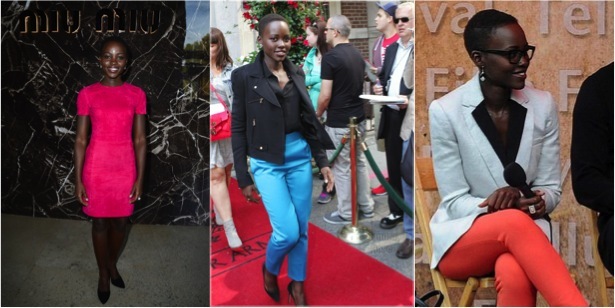 Office chic: While a typical day at the office for Lupita is giving talks at film festivals, the ensemble she wore above would look great in any business-casual setting. Again, it’s defined by a shot of bold color, this time via some gorgeous coral skinny jeans (try this Jack Wills pair). Add on a sand-colored blazer like this one from Reiss, a simple black shell, and some turquoise ball earrings to echo the jeans’ tropical vibe. And if you need glasses, some chunky Ray-Ban Wayfarers will make you look like the genius that you are. Got a star style you’re itching to steal? Share a photo or link in the comments, and our fashion experts will work their magic to help find it for less.